Please arrive by 10.00pm. Latecomers may not be admitted. 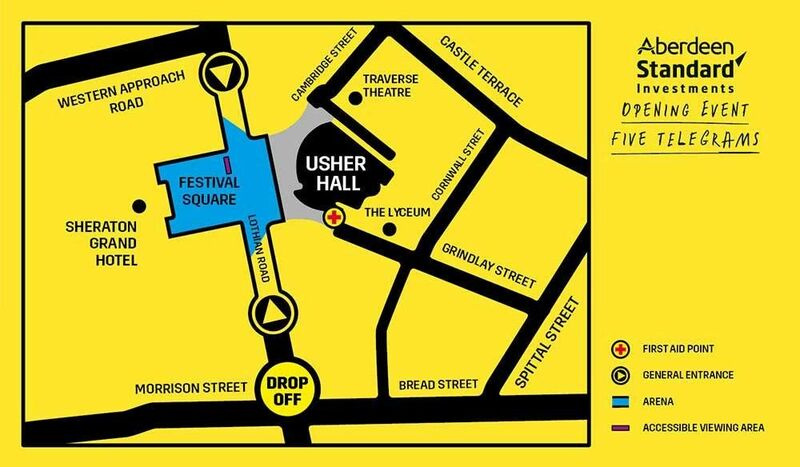 The arena was the area in front of the Usher Hall, across Lothian Road and into Festival Square. Entrances and ticket check points for the arena were on two sides of Lothian Road: one on the corner of Western Approach Road, and one near the Filmhouse cinema. A map of the arena is below. Lothian Road was closed from the West Approach Road to the junction with Bread Street and Morrison Street from around 8.00pm until midnight on the night of the event. Grindlay Street was also closed west of the junction with Grindlay Street Court from 8pm until midnight on the night of the event. There was a drop off point at the crossing by Bread Street and Morrison Street. There were bus diversions in place in the roads surrounding the arena. Visit Lothian Bus's website for more information. The arena was located centrally with frequent bus and tram connections, and only a short walk away from both Waverley and Haymarket rail stations. Visit our travel information page for general advice on getting to and around Edinburgh. The whole arena was accessible to those with mobility issues. There was a platform available for wheelchair users, those who are unable to stand for long periods of time and their companions (marked on map). The platform was filled on a first come first served basis. The following items were prohibited from the arena: glass, animals (except registered guide dogs), flares, fireworks, illegal substances, herbal/legal highs or nitrous oxide, offensive weapons (such as knives with long blades), laser pens, megaphones, and air horns. In the interests of safety and security at the event, bags were subject to security searches. How long was the event? The event ran for approximately 25 minutes from 10.30pm. What would happen if the weather is bad? The event would go ahead despite any changes in Scotland's unpredictable weather! It would only have been cancelled in the event of very adverse weather conditions. In the event of cancellation or delay, updates would be available on our website, Facebook, Twitter and Instagram pages. Were people able to sit down during the event? The arena does not have any seating within it and we strongly discouraged people from bringing chairs. It was extremely busy and chairs posed a safety risk to the audience members. For those with mobility issues who are unable to stand for long periods of time, there were a very limited number of chairs available on the accessible platform. Access to the platform was on a first come first serve basis. The creators strive to make content suitable for all audiences, and comply with broadcast standards where appropriate in cinema and on television. They avoid prolonged strobing images in the problematic 16-25Hz range, and do not use strobe lighting above 4Hz. High contrast patterns and moving images feature throughout the content for this production so if these present a risk of seizure we would advise audience members that they might be at risk if these are triggers for them.